Stitched Together: I Have Yarn! 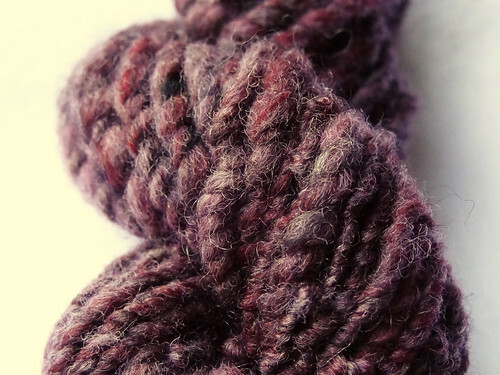 Actual yarn is gracing this blog today. 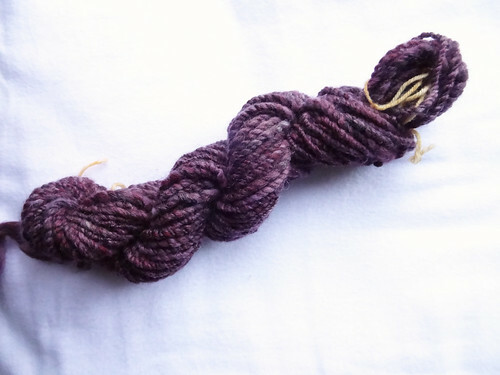 Honest to goodness home spun yarn - I am such a happy blogger! Look what I made! 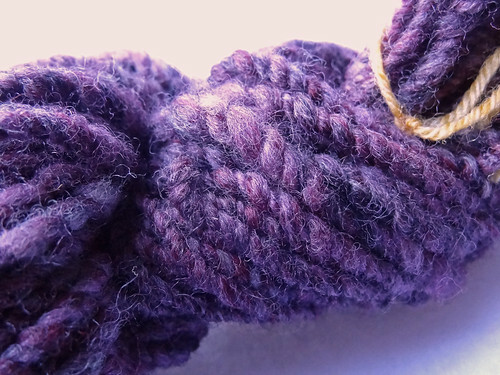 The Romney fibre is beautifully soft and has created a plump and springy yarn. I think this fibre is one I would enjoy working with again, particularly after more practice, because it will be nice to kit with. As I only have approximately 33m of yarn I don't think I'll be able to knit much with it. But it would be nice to have a small swatch to show how it knits up as a fabric. I want to learn about how fibre behaves and I think spinning will inform my future knitting decisions. As the yarn is my first attempt there are lots of places where the spinning is inconsistent with very tightly spun and very loosely spun next to each other creating a thick and thin yarn which varies between 11 and 9 wpi. I also think I overplied the yarn and this helped contribute to the limited length of the yarn. My drafting technique definitely improved throughout the course of spinning this fibre, so hopefully my next attempt will be better. The above photos are a bit inaccurate colour-wise because of the light, but this next photo is much more true. I am pleased with this first attempt and I really enjoyed making it. So much so, that I ordered 200g each of Falkland , Merino and Blue-Faced Leicester to practice on and discover how different fibres feel. I have ordered from World of Wool which seems to have a good selection and the prices were acceptable to me. I have no idea really what tops should cost, so I can only go on what I am prepared to pay. If anyone has any other recommendations for UK sources of fibre, please let me know. I settled on my selection of fibres after asking Twitter, and from comments left on the last post. I think these fibres will be interesting to play with and you never know, by the time I've got to the end of the fibre, I might have useable yarn! 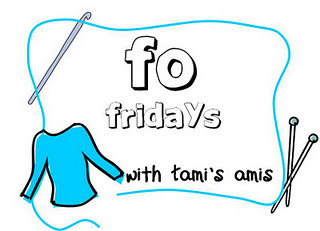 I'm hooking up, as usual, with Tami, so click the button to check out other people's lovely things!